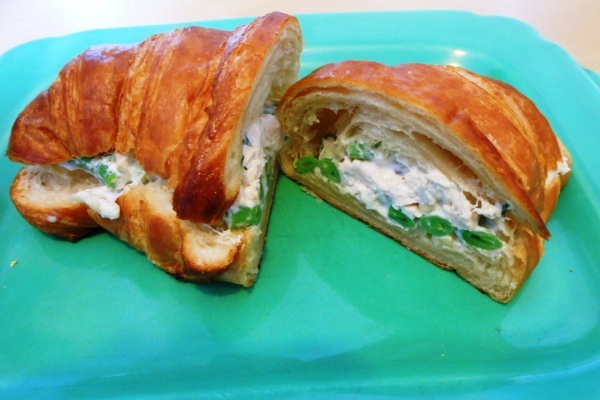 I put this delightful mixture on a croissant because that’s my personal moral stance on chicken salad, but you probably won’t go to chicken salad hell if you use a bagel, roll or other bread product. I’m not ordained in the chicken salad church though, so you may want to consult an official source. Now check out this mondo croissant. Whoa. I list one or two croissants in the recipe in case your neighborhood bakery doesn’t quite have their act together yet. A Yelp review should do the trick. “We want bigger croissants!” But use four stars to show you still appreciate them besides that one thing. It’s democracy. Go forth. Basically you’re looking for a handful of chopped chicken and a handful of chopped green beans. Don’t get too caught up on the measurements. Put first five ingredients in a small bowl and stir to combine. Season with salt and pepper to taste. Place filling in croissant(s). Donezo.